Sunstate Pest Reports – combining years of experience in the building industry as part of your building and pest inspection using both thermal, infra-red technology and microwave radar technology using Termatrac machines. We have been servicing the Caboolture, Kilcoy, Pine Rivers, Glasshouse Mountains, Bribe Island and surrounding areas for over 20 years. From the subfloor to the roofing you will find a complete and detailed report. Also, there will be two separate independent inspectors on site to include all facets of your detailed reports, which is why Sunstate Pest Reports has the knowledge to help you with all your Building and Pest Inspection requirements. Our inspection services include photo taking which will be included on the inspections. By this, we can deliver complete reports with photos of all the flaws in the building for the clients to have a clear picture of the state of the building. 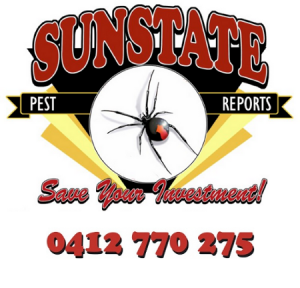 Sunstate Pest Reports our aim is delivering a high quality service at a competitive price to all our clients, and no job is too big or small. Our Reports are always of the highest level of professionalism and quality. We have a range of technical equipment, including a Termatrac Microwave radar sounder, Thermal Imaging Cameras, Moisture Meters and Borescopes which are used as necessary in every Inspection to ensure accuracy and thoroughness. When you are buying a property, it is an important part of the process to carry out building and pest inspections. These inspections are important in giving you information about your intended purchase. Having two licensed inspectors that are highly qualified and experienced in their own fields is much better than having one inspector carrying out both inspections!! They are usually more experienced in one field than two. The Building and Pest inspection is a service designed to assist a property buyer to detect significant flaws in the crucial systems and components of the property of interest. We are experienced property inspectors, and we can tell the condition of any building. The quality of service is what we are guaranteeing you. From the very first point of contact with Sunstate Pest Reports, you’ll be in safe hands. Andre and his crew takes their job very seriously and their priority to have happy and satisfied customers. With over 20 years’ experience let Sunstate Pest Reports conduct the inspection so you know that no stone has been left unturned. The Building Reports are completed by Qualified building inspectors who were previously builders. Thermal Imaging camera’s are used if they find any termite activity with in your new property. All Pest and building inspectors are fully licenced with their own insurances. Both Inspectors are on the job at the same time which allows you to talk to both of us while you attend. Plus we can point out any issues found on the day or call you at night if you are not attending. What the building inspections cover..
You will receive two reports later the same evening. One ‘Visual Timber Pest Report’ and one ‘Building Inspection Report’. Each report will give you detailed information on all findings that occurred during the inspections. We also give you valuable information on areas that need to be addressed to help prevent termite or timber pest infestation in the future. If you are looking for a professional and reliable Building and Pest Inspection service at an affordable price, give Sunstate a call today on 1300 793 311 or 0412 770275. 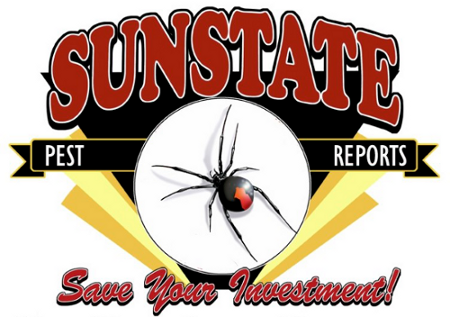 The reasons why you would choose Sunstate Building & Pest Reports. Our Reports are in accordance with Australian Standards. We encourage you, the buyer, to attend the inspection on the day. You will receive your report later that same evening. You can contact us via email or by phone if you have any queries regarding your report and its findings. We take the worry out of inspections for you by liaising with your agentto organise the inspection. We can organise a pre-purchase building inspection for you to be carried out at the earliest convenience. Both inspectors are fully licenced and insured with over 50 years of combined experience!! We offer a professional and courteous service aiming for customer satisfaction and peace of mind! We can supply Tradespeople to repair any problem we find. We use a Termatrac Microwave Radar Scanner on each inspection and have on hand Thermal Image cameras. Inspections are basically where a professional company will look into the crevices and open spaces of the building to find the root cause of the problem. Most pests live in dark spaces like cockroaches who don’t need much solace in order to grow their number and increase. Inspections are very effective, and it will usually lead to finding out exactly what is also causing the problem. Sometimes, it could just be throwing away the garbage or by putting it in the right place in the building. By making better and more wiser choices, you’ll succeed in the long run. Doing annual inspections is extremely helpful because it can allow for you to know exactly what is happening with your building every single year. An annual inspection allows for you to know if there are any new pests that have just appeared recently. It is the ultimate best way to know what kind of services you need to also avoid and prevent more pests from growing within the building. When Is It Best To Do An Inspection? The best time is ultimately in the morning when there is nobody in the building. This makes it so much easier since the professional control team can look into the building and see what is needed to be done. There are certain inspections that can last very quickly, but it all depends on the size of your building and what usually is the problem. With different kinds of pests, each one requires a different type of inspection. Inspections are great to do during the morning when nobody is even at the building yet just to make the process just a wee bit more quicker than usual. However, whatever is best and most easiest for your building should be fine. If you are finding cockroaches, rodents, and any type of annoying pests living in your building, then try to get rid of the problem as fast as possible by getting an inspection. Sunstate Pest Reports can recommend the best way to help control the problem and also remove the pests. You never want to worry about having those cockroaches or rodents stay there, and sometimes they can grow constantly if you don’t try to fix the problem as soon as possible. Hire a professional company to inspect your home, find the best thing that works, and then use only the best systems to make sure those pests die and stop growing. Trying to do it all on your own is not easy, but this is why having a professional team help you is the best way to go about doing this. Try to see what kind of pests you may have. There are companies who will work with you personally for a specific pest that you may have. There are all kinds of pests that may develop in a building. It could be cockroaches, ants, silverfish, borers, fleas, rodents and even fleas. Most buildings that have high floors have higher chances of more infestations because of the problem involved with more possible places for them to live. What Kind Of Service Is Best For Pests? Most pests have different things that can cause them to die, and often times it can be anything from a single pellet or even a type of fogging most that will kill the pests. Depending on what they are, everything is always different depending on the pest. With the right company helping you, they’ll be able to find out what will work best for your specific problem. Killing rodents can involve traps that will kill all of them one by one, and then for cockroaches it could be pellets depending on the situation. Dealing with countless pests in your home or your work can be troublesome. When your building is completely infested, not only does it tick off clientele and potential customers, but it also creeps out some of the employees and may prevent them from roaming around the building without hesitation. Building and pest inspections must always be considered to be able to find out where the infestation of the pests are taking place. Some of them may be building a home, and others may be able to enter through an opening or crack in the building.